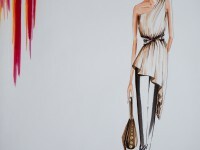 Lindsey Kate Meyer, an experienced fashion illustrator, works with clients of all degrees of experience. She has worked nationally and internationally with bloggers, stylists, personal shoppers, online retailers, fashion trackers, large companies, fashion and accessory designers, and many individuals to create custom illustrations, designs, and logos. 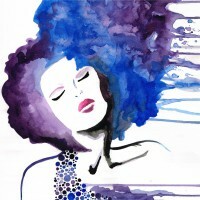 Illustrating, often under strict deadlines, Lindsey seeks to create work that is captivating and fresh, constantly exploring new techniques and media. Her primary materials to work with are marker and watercolour, but she also often works with pencil, acrylic, gouache, colored pencil, ink, and other mixed media. 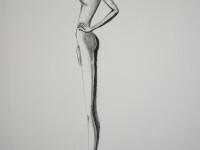 Creating work that captures the elegance, beauty, and confidence of the female form is something she strives to convey in each piece. Lindsey enjoys working with new people and new ideas, with the opportunity to alter the mood and portray new ideas each time. 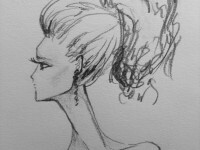 However, she also finds inspiration in studying historic illustrators and their talents. 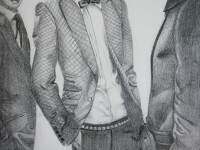 With this knowledge, as well as a proficient understanding of color theory, textiles, construction, fit, and concept design allows her to successfully illustrate technically accurate designs. 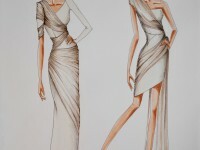 Illustrating brides is something Lindsey has always had an interest in. Drawn to the style and sentiment attached to a woman's most extraordinary day is what Lindsey finds really appealing. 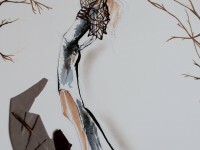 Capturing this elegance and uniqueness that each bride possesses is the idea behind her one-of-a-kind illustrations. While working as an alterations specialist in a bridal gown store she gained a better understanding of a woman's wedding day and the individuality that each bride strives to feel. 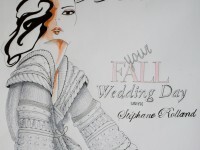 This is what she attempts to exemplify through her work as a bridal illustrator. Each piece can be customized to match the bride's hair, makeup, accessories, and gown. With a choice of paper, media, and pose-these illustrations not only make a great piece for the wall alongside a wedding photo, but also make a wonderful gift for newlyweds and anniversaries. She typically works on an 11"x14" scale for these pieces, but can customize the work to match nearly any dimensions. To view her custom bridal illustration portfolio visit www.lindsey-kate.com/custom-bridal-illustration or contact her at info@lindsey-kate.com to learn more. Modern art and the theory behind it have always been Lindsey's areas of interest and it continues to motivate her and her creations. It is the emotional involvement in the work that really intrigues her, not just in the creative process, but even more so in the viewing of the finished product. She hopes that the work she creates can evoke an emotional response for each and every person, allowing them to get lost in the expanses and interaction of color. No two people's interaction with the piece will probably ever be the same, she believes. Even within one viewer, as their mood changes so can the aura of the piece, making abstract art endlessly exciting. 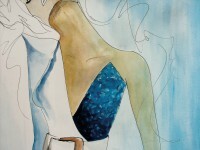 Lindsey Kate creates custom original work, but her pieces can also be printed on canvas and purchased as enlargements. 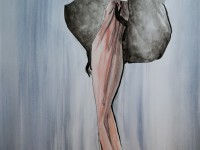 To view her acrylic painting portfolio visit www.lindsey-kate.com/paintings. To contact her about work or purchasing a print, email her at info@lindsey-kate.com.